This little list of must-haves for spring will excite you! My Vegan Spring Essentials Guide is an A-Z list of products and brands to have you melt the winter blues away! I am all about the pastels and I will find any excuse to incorporate pastels and soft tones into my wardrobe, makeup and accessories! Every year mother nature reinvents itself, recreates its beautiful splendor. I love spring because I love the rain. The rain to me is not a nuisance but a beautiful gift that feeds the earth, and washes away all the gloom from winter. 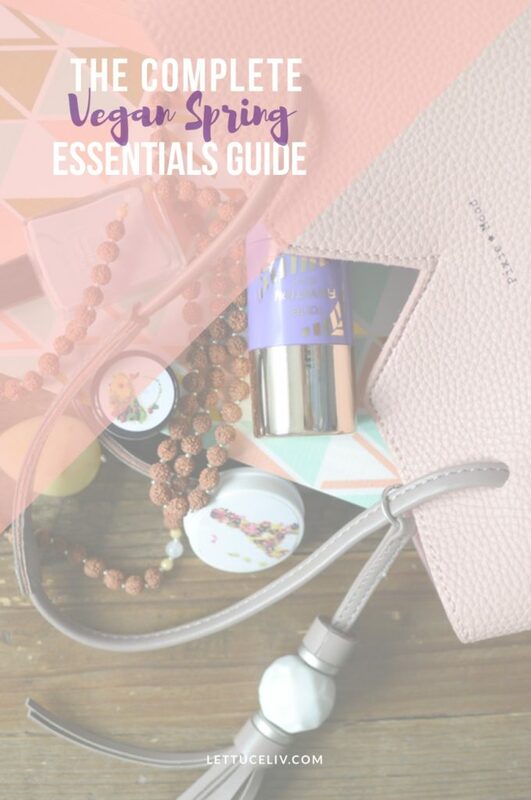 To celebrate the awesome that is spring I have created this guide book of brands and products to help you find the stuff you will love the most this season. Because it is so easy to be fashionable and help the environment by buying vegan and cruelty free products. Gone is the day that a vegan was labelled a HIPPY… unless that’s your style of course. Before I begin I want to advise you all that some of these products were given to me by brands. HOWEVER, if I do not like the brand or product I did not add it into this list, so do not fear because this is 100% my true opinions below! Every season we search high and low for the coveted essential bag that will make you feel like you can conquer the world. Well my friends I found you the spring purse that will change the way you look at leather. The bag I speak of is by Pixiemood.com they are a Canadian company that have dedicated their entire brand to making vegan and cruelty free bags. The entire collection for the spring is actually out of this world amazing! 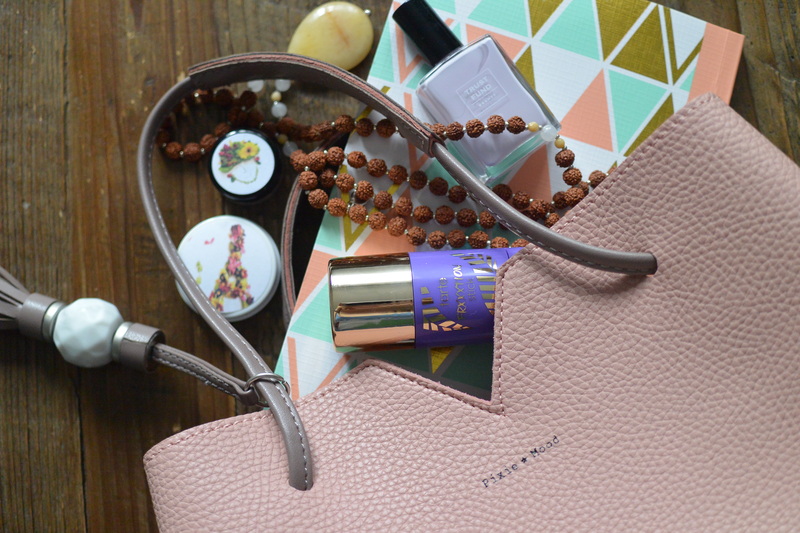 The bag that stole my heart is called The Jasmine and she is a beautiful soft pink with a brownish taupe accent and with a really cute marble like tassel. Speaking of tassels, I really think this is a trend for the spring I’ve been seeing it a lot lately and having it part of this bag definitely shows that it’s a new trend on the rise…OK back to the purse- has a drawstring and magnetic closure. Also, features a small zip pouch and short handles that can be adjusted to a long strap. The Bag can hold a lot of stuff especially some of the next products I am currently obsessing over! Although I just did a vegan essentials makeup post I want to also let you know of two other products from an indie vegan brand that are perfect for the spring! Boho Chic Cosmetics makes small batch products with minerals and infused flowers! 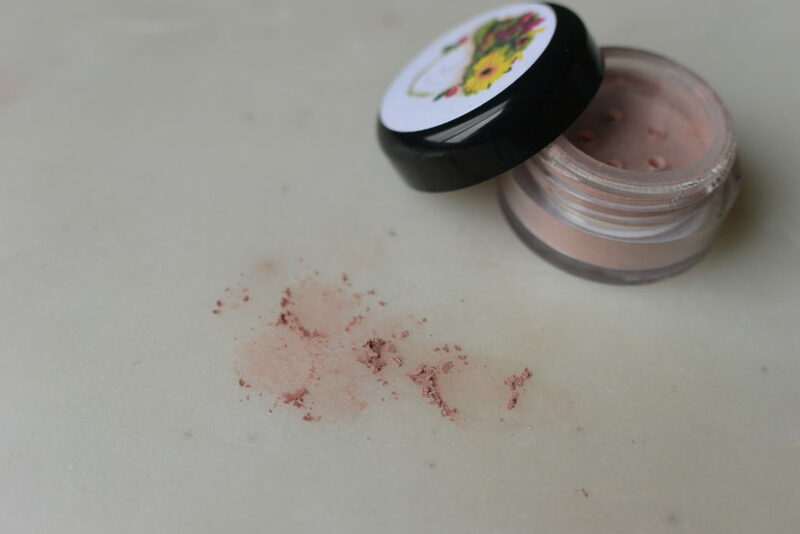 I feel in love with a mineral powder eyeshadow blush fusion. 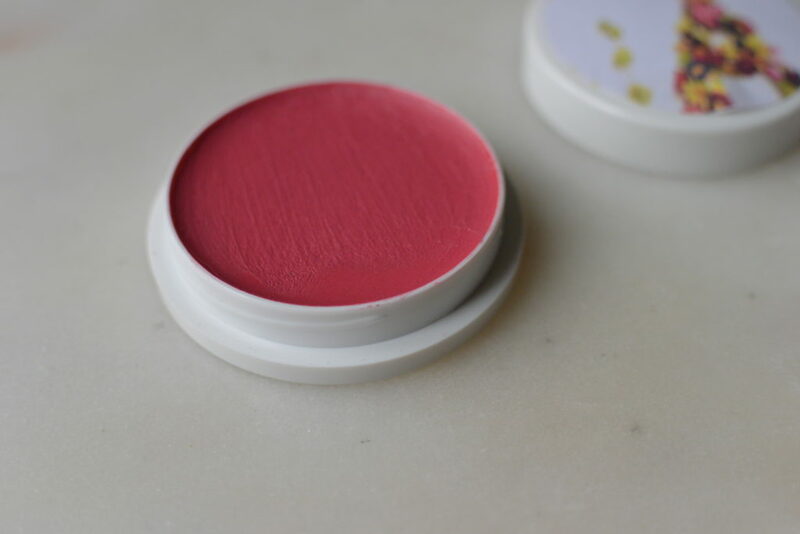 Its in the colour TULIP (perfect for spring already right!) some of the ingredients include, lavender, rose petal and jojoba oil! This beautiful colour is a little bit peachy and a little bit berry works beautifully for a soft and pretty spring look! The next product from this brand that I am obsessing over is from the Parisian Macarons Lip & Cheek Collection in the colour strawberry. I mean from the title I was already sold. Lip tints that are inspired by a Parisian delicacy! SIGN ME UP! not to mention this tint is made with macadamia nut oil, cocoa butter, almond oil, green tea, coconut oil and vanilla bean. All these awesome hydrating oils make for super plum and moisturized lips and extra youthful looking cheeks! Now that we are thawing out of our igloos we can expose our skin to the elements without fear of frost bite. I do this by exfoliating with Tartes Frixtion stick. This exfoliator/mask is the best thing ever! Its super easy to use and its convenient. I actually keep it in my gym bag so I can use it in the locker room after I finish my work out. All you do is massage the stick in a circular motion on damn skin. Then you exfoliate! Next you can either rinse it off or let it dry for 10 or so minutes. You will have even more impurities pulled from your face. This stick is great for you because you want to eliminate you clutter in the bathroom (spring cleaning!). Its an awesome 2 in 1 that really shows results. 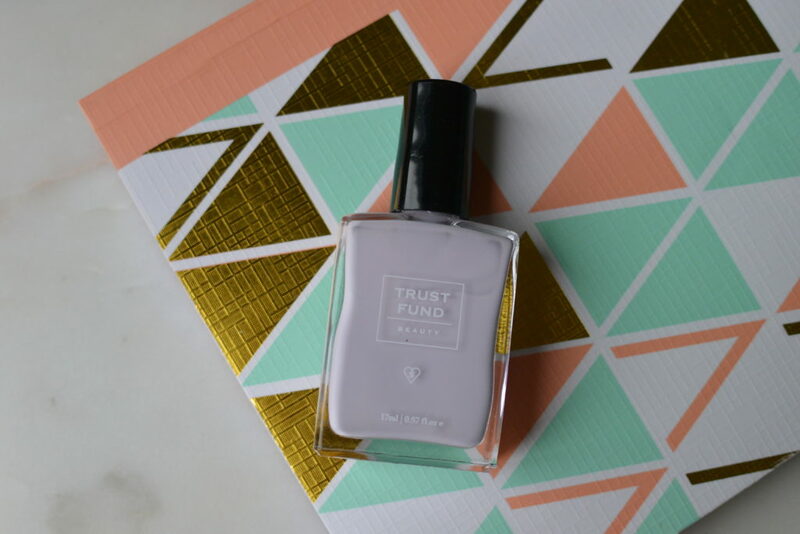 Trust fund beauty has been a staple nail polish brand in my household… I even forced my friends to do a beauty haul on there website with me last year…My all time favourite shade for spring is “Put A Ring On It”. this bright lilac is the ultimate spring colour and works well way into summer. Trustfund beauty is an awesome brand that is free from 10 of the harmful ingredients found in standard nail polish. It is also vegan cruelty free, paraben free and even GMO free! Since I was 12 I have always carried around a sketch book in my purse. There I would sketch on my ride home. Jot down quick reminders and write my thoughts and feelings in the moment. But over the last few years my sketchbooks no longer held drawing but just pages and pages of words. This season I finally gave up and admitted to myself that my creative process is no longer that of a fine artist. I don’t recall if I told you but I have studied fine arts for 5 years. Painting and drawing used to me my go to when ever I had any free time. Now I spend my free time writing, creating recipes and taking photos. My final spring essential is to bring something with you that will help inspire you to follow your passion. For me it is carrying around a note book where I can jot down recipes, thought and intentions. I am a firm believer in meditation and setting your intentions, for your day, week, and season. I love Tiny Devotions mala beads because these beautifully crafted malas are created with the purpose to ground and set your intentions for what ever it is you need. My very first mala bead necklace was a gift from one of my closest friends. 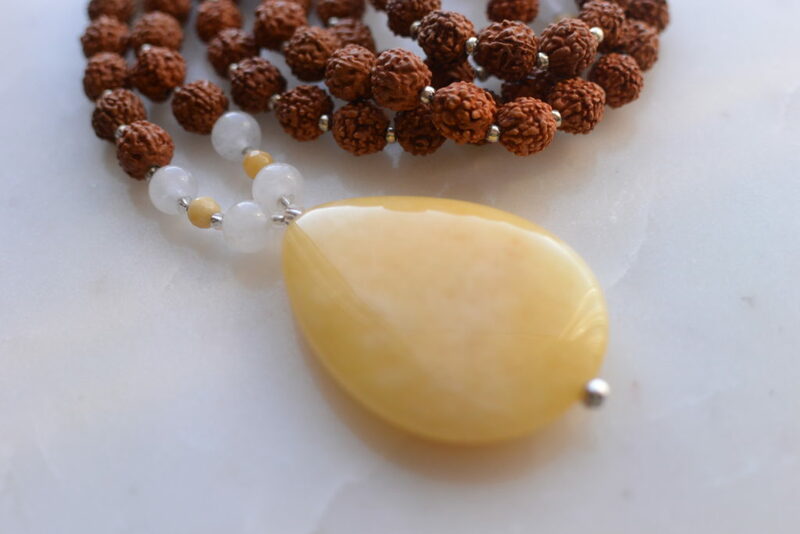 It is a yellow jade beaded mala from tiny devotions this necklace is the good vibes mala. I love this mala because of its purpose. It is meant to remind me to be a positive person and allow only the good to flow from me. And to carry my positivity around me like an accessory. When making this post, I was thrilled to share with you the link to this necklace. Only to discover it is no longer in stock but if you scroll through the Tiny Devotions Instagram you will find pictures of this mala necklace! This season my mantra is SO-HUM this translates to I am that… This means you are identifying yourself with the universe. I found this great article by an amazing Yoga instructor Shiva Rea where she explains the meaning behind it more in-depth. To summary her article she explains that SO-HUM has two meanings. The first being So sounds like the sound our breath makes when we inhale. And HUM is the sound our breath makes when we exhale. And second the meaning Of I am That refers to the creation of all of us- the entire universe and all of the beings breathing at that very moment. How beautiful is that. This mantra helps remind us that we are all connected and we are all affected by each other. Great way to start the new season. Especially the one where we see first hand the beauty of creation; budding flowers as the rain washes away all the grime from winter. I find meditation completely invigorating and this time taken for self reflection and the focus on breathing is wonderful. So my amazing friends take this time to create your own intentions. Choose a mantra to help fulfill your goals for this spring. If you’ve never meditated before there are some great free apps that have easy to follow along guided meditations I highly recommend you try it out for yourself. My favourite app is called CALM I use it when I go on flights it really helps my nerves when flying. Read essentials guide for flying where I speak about it more! 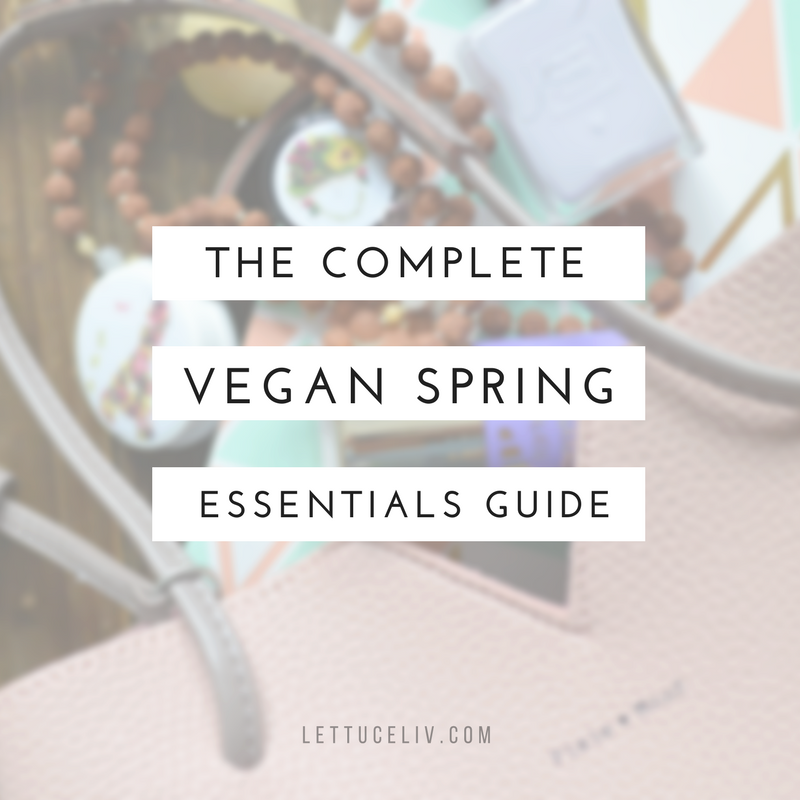 I hope that this guide to vegan spring essentials has been of some help to you. I love making these little essential guides because I love to share what I love. All these brands are ones that I enjoy and they hold ethical standards towards the environment . They are of course are cruelty free and vegan. If you liked this post, please share it with your friends and family! leave you with this question what mantra do you use most ? Or if you have never used mantras or meditated will you start now? I agree with everyone else: That bag is so cute!! That bag is lovely. And I agree with you, looks like those bag tassels are trending nowadays. Love the choice of color here. You look gorgeous. That bag and that lipstick are gorgeous! Thanks for sharing. I love seeing other vegans suggestions for products they love. The bag is beautiful! What a pretty pink & purple-y post! Love that handbag, and good to know about the vegan make up. Thanks! Sounds like you found some great brands and products to check out! Cute! I really like the purse and the necklace. I love that necklace SO much! And with the blush purse, it’s perfect. Hey!!! Thank you for the information, very impressed. 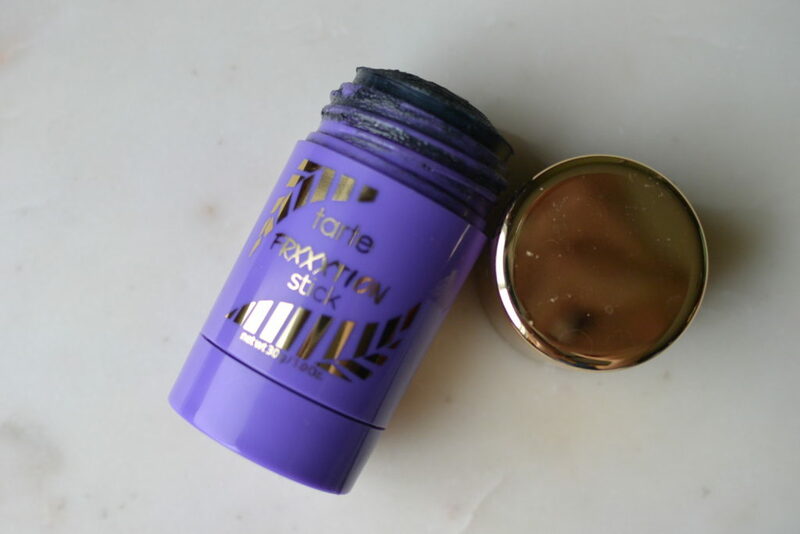 I love Tarte, I have a few items from them, I haven’t tried the frixtion stick, but I will definitely give it a try😊 Sounds interesting. About the yoga, at first I wasn’t crazy about it and then my friend motivated me to try it again and I really enjoy yoga now, I hope I can fit it into my busy schedule. Love this😘❤ Keep it up, I am a huge fan! !